First you need to sprout your wheat. You’re going to need a very large bowl as the grain swells up to about double it’s size. 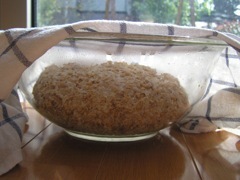 Put in the grain , fill with water, cover with a clean cloth and leave to soak for about 18 hours. Next drain off the water (having a lid with holes or a sieve will help though I managed without), re-cover with the cloth and leave out of sunlight to sprout. You’ll need to keep rinsing the grains morning and night until it begins to sprout. This should take a day or two. You can see the grain just beginning to sprout in the photo below. 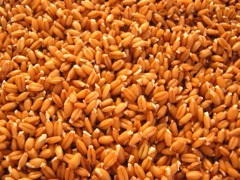 Once the grain reaches this stage it’s time to grind. Again, having a good food processor will help but I managed with a little one. First drain off all the water and if possible leave for half an hour or so in a sieve for it to air dry. If you’re using a bowl as I did the water can collect at the bottom making it difficult to drain off. Next you will have to prove your yeast. 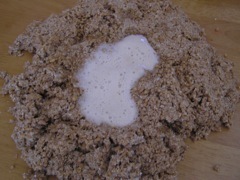 Add the dried yeast to the warm water and leave for about five minutes until it’s frothy. Whilst it’s proving clean a large space on your table and spread out your grain, making a well in the center. 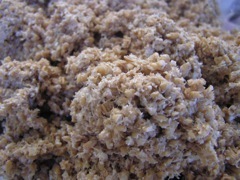 When the yeast is ready pour it into the well along with the syrup and the salt. 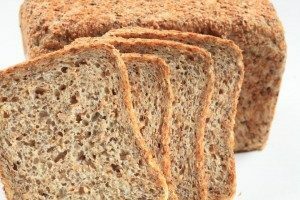 Fold these ingredients into the grain. DO NOT ADD FLOUR! 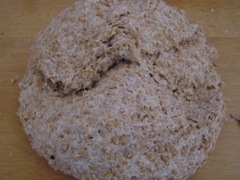 At the start it’s unbelievable that the grain will form a dough. It will be falling all over the table and breaking apart but keep at it. After about ten minutes (yes, ten) it will start to form a cohesive ball. Keep on kneading for another five or ten minutes (it’s tough I know but worth it!) and you’ll end up with a regular elastic bread dough. 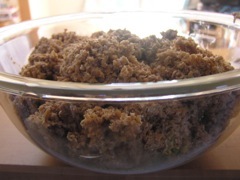 Place the dough in a bowl, cover with a damp cloth and leave it somewhere warm for an hour or two or until it has doubled in size. Press out the dough to get rid of any air bubbles, cover with the cloth again and leave for another hour or two. Press out the dough again and shape into an oblong. 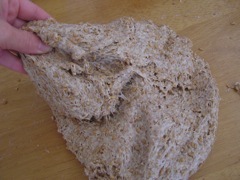 Place the dough in an oiled bread pan, cover again with the cloth and leave somewhere warm for about an hour. Meanwhile heat your oven to 180 degrees. Bake the loaf for 45 minutes or until it sounds hollow when you tap the bottom. 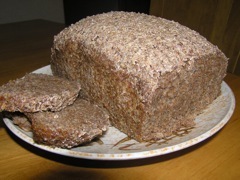 With any luck you’ll end up with a loaf which looks something like the one below! 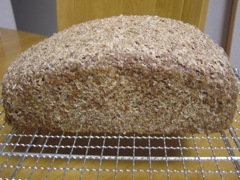 I had a bit of trouble draining the water off the grain (I kept finding bits of grain all over my kitchen for days!) so ended up with a denser loaf than I should have done. We’d love to see some photos of your loaves!